Skincare brand, KORRES has announced the launch of the Roses Are Red Japanese Rose Valentine’s Day Gift Set. The special edition gift set contains a trio of KORRES Japanese Rose Collection best selling products which is inspired by roses native to Asia. Creamy-foam shower gel with a long-lasting moisturising effect that helps reduce the visible signs of ageing. A moisturising body milk with a powdery texture and rich in trace elements that awaken the epidermis, offering an energy boost. The combination of pro-vitamin B5, Shea butter and Jojoba oil enhance the suppleness of the skin, while providing long-lasting hydration. Hydrating, non-oily hand cream with a light texture. Almond Oil, Provitamin B5 and Shea Butter improve skin elasticity. Calendula nourishes and repairs, while retaining natural skin moisture. KORRES is a natural skincare brand, founded in Athens in 1996. Based on over 3,000 homeopathic remedies of herbal origin and its pharmacy experience, KORRES focuses on primary and applied research involving natural ingredients and formula. KORRES extract and isolate the active ingredients of their plants, at their environmentally friendly, certified herb extraction unit. Greek Flora: Olive, Bay Laurel, Mastiha, Thyme, Sage etc. Medicinal Herbs: Evening Primrose, Calendula, Echinacea, Hypericum etc. Food Ingredients: Thyme Honey, Yoghurt etc. Natural Actives: Actives such as natural antioxidant Quercetin, with proven efficacy, according to the findings of international research programmes including the research programmes of the Korres Research & Development Lab. KORRES celebrity fans include: Rihanna, Kylie Minogue, Jodie Kidd, Angelina Jolie, Victoria & David Beckham, Drew Barrymore, Sienna Miller and Scarlett Johansson - just to name a few. 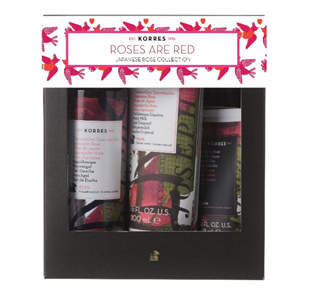 The Roses Are Red Japanese Rose Valentine’s Day Gift Set is now available for €21.00 from KORRES, lookfantastic.com and feelunique.com.